The Eagle Nebula or M16, is also known as the Star Queen Nebula and The Spire. 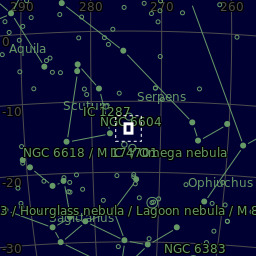 It is a young open cluster of stars in the constellation Serpens, discovered by Jean-Philippe de Chéseaux in 1745–46. Both the "Eagle" and the "Star Queen" refer to visual impressions of the dark silhouette near the center of the nebula, an area made famous as the "Pillars of Creation" photographed by the Hubble Space Telescope. The nebula contains several active star-forming gas and dust regions, including the Pillars of Creation. Images taken by Jeff Hester and Paul Scowen using the Hubble Space Telescope in 1995 greatly improved scientific understanding of processes inside the nebula. One of these photographs became famous as the "Pillars of Creation", depicting a large region of star formation. The small dark areas in the photograph are believed to be protostars (Bok globules). The pillar structure of the region resembles that of a much larger star formation region in the Soul Nebula of Cassiopeia, imaged with the Spitzer Space Telescope in 2005 and characterized as "Pillars of Star Creation". or "Pillars of Star Formation". These columns – which resemble stalagmites protruding from the floor of a cavern – are composed of interstellar hydrogen gas and dust, which act as incubators for new stars. Inside the columns and on their surface astronomers have found knots or globules of denser gas, called EGGs ("Evaporating Gaseous Globules"). Stars are being formed inside some of these EGGs. X-ray images from the Chandra observatory compared with Hubble's "Pillars" image have shown that X-ray sources (from young stars) do not coincide with the pillars, but instead randomly dot the area. Any protostars in the pillars' EGGs are not yet hot enough to emit X-rays. Evidence from the Spitzer Telescope suggests that the pillars in M16 may already have been destroyed by a supernova explosion. Hot gas observed by Spitzer in 2007 suggests that the area was disturbed by a supernova that exploded some 8,000 to 9,000 years ago. Due to the distance of the nebula, the light from the supernova would have reached Earth between 1,000 and 2,000 years ago. The more slowly moving shock wave from the supernova would have taken a few thousand years to move through the nebula and would blow away the delicate pillars – but the light showing us the destruction will not reach the Earth for another millennium.